Let us ring you back when it's convenient. Sashglass started in January 2007 after I had been sent a sample of a Slimlite unit and seen it for what it was; what we had all been waiting for since the introduction of Document L in 2006 when we were all pulling our hair out, conflicted by the desire to be green and at the same time preserve the look of our windows. At the time I had a sash renovation company. In 1990 had I bought a 5 bedroom house in the East end of London with 13 sash windows, mostly rotten and “blown in” by Hitler’s Luftwaffe. So I learned how to renovate a sash window the hard way. 13 times. At least in London we had a chance to rinse out our brushes between paint jobs, and rot didn’t spontaneously set in even as you put the tools in the van. This was the case, or so it seemed, when I moved to Deal and set up here. Our seaside air is so much more corrosive, to say nothing of the North winds which rattle down the East Coast forcing freezing air into luke warm rooms on the front. Sashes need a lot more care around here. Having seen said sample I approached Slimlite about representation. They had no website at that time and were not marketing it very forcefully. So, having been given the ‘agency’ I immediately built a website with Smartstep and started spreading the word, running until Sashglass became profitable enough. Last year we sold over 12,000 Slimlite units, advising, providing quick quotes and looking after the progress of hundreds of orders. We are now their largest customer. They comply with Building Regulations Document L England for improved thermal insulation. The 5mm perimeter seal of Slimlite Double Glazed Units enables them to be glazed into 7mm deep glazing rebates found in most sash windows. The smaller cavities between the glass reduce the required glazing width rebates and enables slimmer sections to be used. 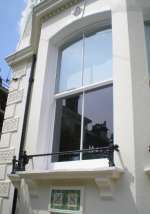 They are the only double glazed units that can be glazed into most standard glazing bars of a sash window. They can be glazed into most existing single glazing glass rebates.